If you are a local business, you should expect that your to see a drop off in Foursquare check-ins as the Foursquare officially drops the check-in feature from their app. Foursquare is dropping user’s ability to check-in, the feature that made the company famous. Instead, users will now have to download a second app in order to check-in. 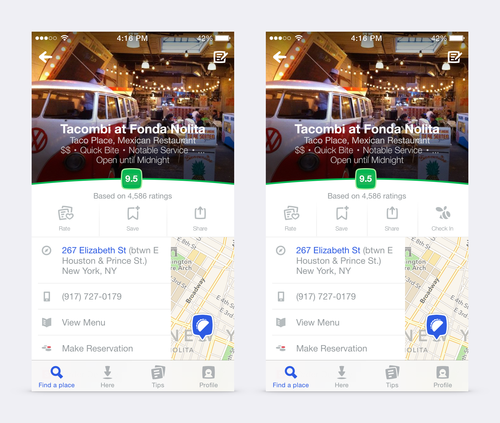 In May, Foursquare announced it would be splitting their local functionality with their check-in functionality in a move many saw as transitioning Foursquare to be in line with other popular local apps such as Yelp. Along with the change, Foursquare has introduced a brand new logo that looks nothing like their former familiar one. For check-ins, users will now have to download and install a separate app from the company called Swarm, which will merge check-in functionality with FourSquare. Without the Swarm app, checking-in at a location will not be an option, instead it only displays relevant local information such as info, ratings and the ability to see the menu or making a reservation for restaurants. Swarm still shows the old Foursquare logo as part of their own logo. Here are the two versions – the one on the left is Foursquare alone, while the one on the right also has the Swarm app. Foursquare says that three-quarters of all users are already using the Swarm app. However, the new checking button isn’t nearly as noticeable as the old check-in button, so this could definitely impact the number of check-ins as well. Interesting article. They could have just amplified the reviews in the app without taking out the main reason people use the app….to check in and become mayor. It’s so difficult to read the text on this site. It’s way too light. Thanks for letting me know about the text… I’ll play around with the colors again.